Postdiluvian Photo » Blog Archive » Frisbie St. I forget now how I heard about Frisbie St. That’s the problem with procrastinating two months before writing this blog. I guess I saw the poster somewhere in Alameda. I probably noticed the photo of the woman first, then the fact that it was advertising a photography exhibit. That’s the problem with being a guy. I plugged the address into my GPS, and a photographer friend and I headed over on opening night, Friday, September 25. We were in downtown Oakland, near the heart of Art Murmur. And then we were in a residential neighborhood. Where’s the gallery?!? My GPS announces, “your destination is on the left.” We were outside a house just 350 feet from where I use to live back when I taught high school in Oakland. 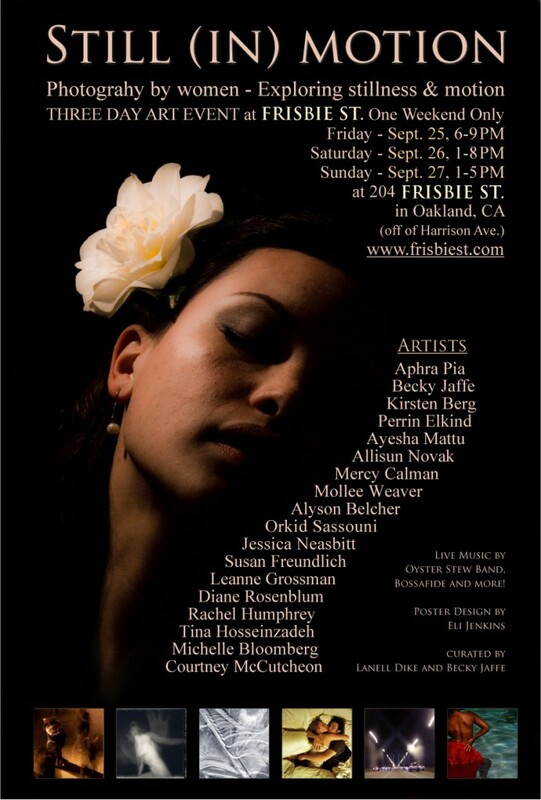 Frisbie St. is an alternative art space formally launched in May 2009. Located at 204 Frisbie Street in Oakland–in the Oakland Avenue/Harrison Street neighborhood–it’s a residence where the occupants move their furniture upstairs during events. But once you get inside you forget that. Photos by eighteen artists hung on spacious white walls. Work which stands by itself yet worked as a cohesive whole. A crowd of interested, engaged artists and art lovers. Watermelon. This was more than a house party. The curators done good. 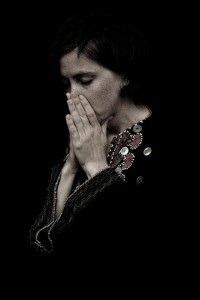 “Still (In) Motion,” photography by women exploring stillness and motion, was curated by Lanell Dike and Becky Jaffe. Highlights included Argentina’s translucent azure glaciers by Perrin Elkind. Closer to home, abstract fine art/landscape pieces by Mercy Calman display beautifully complex patterns in rippling water. And portraits by co-curator Jaffe–including the image that drew me to this show–consistently but ambiguously convey their subjects’ emotional intensity. What are they feeling? Bliss? Passion? Pain? Eventually we migrated to the backyard, where Adrienne Shamszad was performing an absolutely amazing acoustic set. She’s a twenty-something (maybe. barely.) Blues singer and guitarist who describes herself in one song as being “ancient by 21,” and you readily accept that. We were sitting around in lawn chairs barely believing how good she is. It was like going to 49 Geary and finding Jewel playing on the 3rd floor. It’s too late to see “Still (In) Motion” which, regrettably, ran for a single weekend. 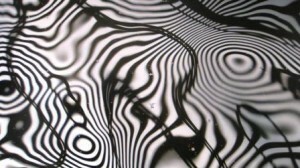 But check out their next exhibit, “Illuminating Shadows,” scheduled for January 2010. With great artwork, people, and music, Frisbie St. is a fine addition to the neo-hip Oakland art scene. This entry was posted on Monday, November 30th, 2009 at 11:27 pm	and is filed under Artists, Events, Raves. You can follow any responses to this entry through the RSS 2.0 feed. You can leave a response, or trackback from your own site. Cool review Michael, sounds so neat to stumble onto something like that. Wow! What a great discovery. As more and more venues close due to the economy these places will become crucial. We have started hosting house concerts in our own home as a way to support musicians having a place to play other than bars. I hadn’t thought about hosting a “house gallery” though. Thanks for blogging and letting us know about this.